Another amazing, unforgettable concert on Saturday night, in Brooklyn. 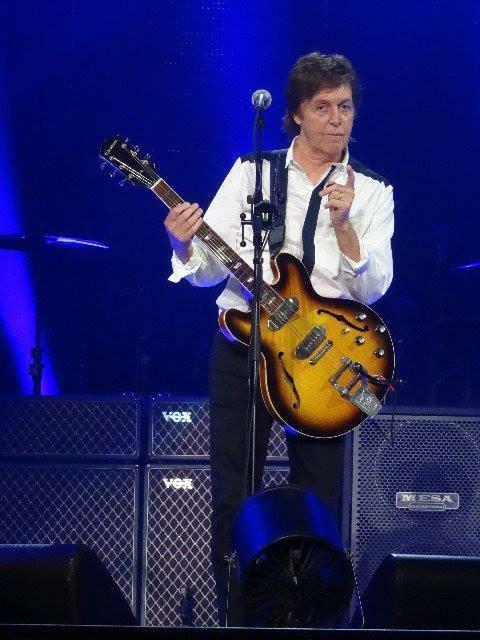 It was Paul’s first time performing in this borough, at the new Barclays Center, and he brought the house down. There are not enough superlatives to describe the show. He gave us at least 6 or 7 songs not in the last tour, and most that he NEVER performed live previous to this 2013 Out There Tour. The A/V show prior to the concert was mostly brand new and the lighting effects was first rate. Paul and his band hit the stage at 8:50PM to a thunderous ovation and they ripped into Eight Days a Week, one of the new songs. For those going tonight or later this summer, I won’t mention the songs here (if there are any of you left who do not know the impeccable set list). For those of you who don’t want to know, it is hard, not impossible, to avoid)! Paul mixes up about three dozen Beatles, Wings and Solo songs in his set that didn’t end until around 11:30PM. We saw many FEST regulars there and also many parents who brought children to see Paul. We can safely say that these youngsters experienced the greatest concert THEY WILL EVER SEE!!! Tonight, our entire family is going (Mark, Carol, Michelle & Jessica) and we are counting the minutes! After headlining at the Bonnaroo Festival on the 14th, Paul is off for some concerts in Europe and returns to the states in early July for another series of shows, beginning at Fenway Park in Boston on July 9th. If you have seen Paul on this tour, tell us what your favorite highlights were. We know there so many to choose from! !